In this day and age where mobile technology plays a crucial role in the productivity of many businesses, mobile security has become an extremely important issue. 10 years ago, many considered mobile threats such as mobile phishing as new and unlikely, and even considered themselves safe from such attacks. Fast forward today, more and more companies are falling victim to ransomware and cyber extortion executed through mobile phishing. In fact, more than 1.5 million new incidents of mobile malware have been detected in the first quarter of 2017 alone, according to reports from McAfee Labs. On another separate study by Dimensional Research, it was also revealed that 20% of companies surveyed said their mobile devices had been breached. What’s alarming is that a quarter of respondents did not even know they have experienced a cyber attack. Such inability to recognize threats in mobile devices can cost a business their reputation and ultimately, their customer’s confidence in the brand. Although no business is safe from being a target of a cyber attack, building an effective barrier against common attacks used to snoop on mobile devices – such as mobile phishing – is a significant step to reducing the risk that every company faces these days. 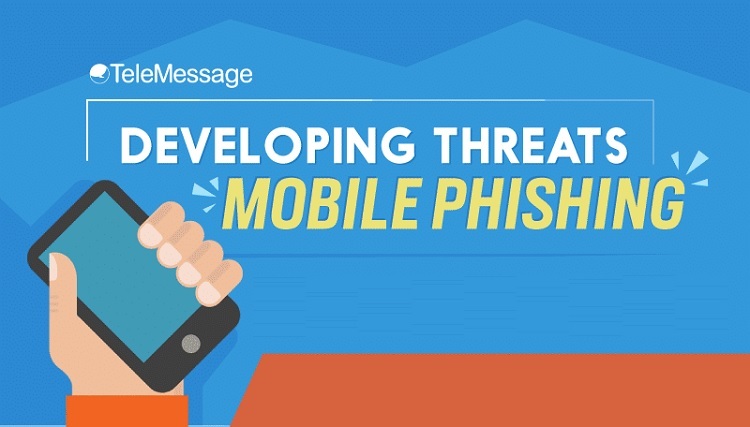 To help you familiarize with the latest threats in mobile phishing, we present the Infographic below from TeleMessage.